Mr Dombret said a pan-EMU deposit-guarantee scheme and a debt resolution fund would require “a genuine, democratically legitimated fiscal union” and a new treaty. “A banking union is a sensible way forward as long as liability and control are aligned. What I mean is you don’t give somebody your credit card if you don’t know what he or she is going to do with it,” he later told ITN. 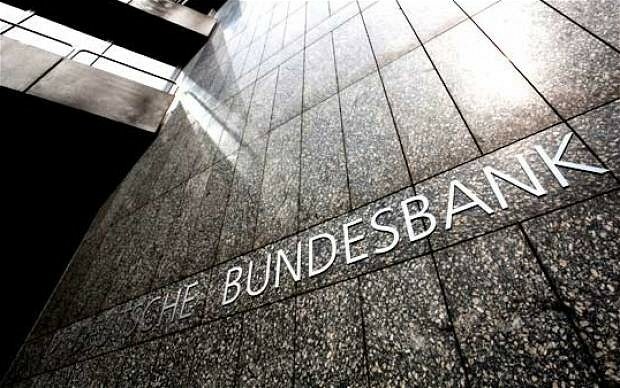 The Bundesbank’s vice-president Sabine Lautenschlaeger hammered home the point in what is a clearly co-ordinated push to check the plan. “The result would be a pooling of the governments’ liabilities through the back door,” she said. “Whoever is footing the bill must also have a right of control, particularly when it comes to the large sums that are seen in banking crises,” she added, alluding to rulings by German courts that unquantifiable EU liabilities breach Germany’s constitution. Chancellor Angela Merkel endorsed the tough line at a party conference yesterday, insisting that Germany will not accept variants of debt pooling or eurobonds until Europe has created a machinery of joint government. Mrs Merkel said the failure of the European Banking Authority to uncover festering losses in Spanish banks in a series of stress tests showed that national regulators — acting out of “misguided national pride” — cannot be trusted to do the job. The Chancellor said countries must be willing to give up sovereignty to an EU banking supervisor for “specific purposes”. This is not the same as a banking union. It is limited to financial policing — either beefing up the EBA’s existing powers or switching the oversight role to the European Central Bank. The dawning realisation that Europe still has no unified response to the debt crisis led to a further day of extreme stress on the debt markets. Yields on Spanish 10-year bonds punched to a post-EMU high of 6.84pc on Tuesday, while contagion pushed Italian yields to 6.28pc. Steen Jakobsen from Saxo Bank said the technical signals in the market are turning ugly. The Italian yield curve is “flattening” as investors short 2-year debt to hedge their holdings of long-term debt, the sort action seen in Greece, Portugal, Ireland, and Greece before they needed rescues. “This is bad, bad, bad,” he said. The dash for save-havens pushed yields on Switzerland’s 2-year debt to minus 0.37pc, the lowest in history. Meanwhile, the €100bn rescue deal for Spain has run aground on fears that mushrooming bank liabililities — amid a deep double-dip recession — will push Spain’s public debt above 100pc of GDP and break the sovereign state. Leaked details of a four-way teleconference between the US, Italian, French, and German leaders two weeks ago show that Mr Merkel was warned explicitly that German insistence on a sovereign rescue for Spain risked great damage to confidence and a dangerous chain-reaction. This is exactly what has now occurred. Italy’s Mario Monti argued — with US and French backing — for use of EU funds for a direct recapitalisation of Spanish banks in order to ring-fence the crisis. Mrs Merkel said she could not justify use of taxpayer funds to bail out banks. The damage has been compounded by fears that the money will come from the European Stability Mechanism, or bail-out, fund. This will subordinate other creditors, leaving them with greater losses if Spain fails to recover and needs debt relief. Germany’s daily Handelsblatt reported that German finance minster Wolfgang Schaeuble has vetoed attempts by EU officials to circumvent the problem by using the old (EFSF) bail-out out machinery instead. Paul Marson, from the Swiss bank Lombard Odier, said bondholders are right to fear large losses. “There is a poison pill at the heart of the Spanish banking system. It will have to restructure its debt,” he said. Europe’s leaders will chew over broad proposals for “fiscal union” at a summit in late June but France is opposed to any major loss of sovereignty. One EU diplomat said Germany itself seems to be schizophrenic. “If they woulld actually tell us what they meant by fiscal union, we may get somewhere. I don’t think we will have anything beyond a roadmap from this summit,” he said. Italian law professor and elder statesman Antonio Padoa-Schioppa wrote in an open letter to Mr Schaeuble that “the German government is playing with fire” by blocking the crucial steps needed to halt the immediate crisis and restore faith in monetary union. Yet Germany is in an extremely difficult position. Bundesbank support for fellow central banks in southern Europe and Ireland through the ECB’s internal Target2 payments system has rocketed to €699bn, mostly to cover capital flight and emergency liquidity support for lenders. This alone is 27pc of German GDP. Ambrose Evans-Pritchard is The Telegraph’s International business editor. Repercussions – coming to a neighborhood near you ! All the Paulsen – Phil Gramm concocted banksters playdays, once Glass-Stegall was repealed, will come home to roost, as the 1/4 quadrillion dollars in fraudulent derivitaves ( which BOTH parties obediently endorsed ) hangs over USA like a Death Star, due to crash. Enjoy your soon-coming 3rd world status – debt and servitude. You voted for it and cheered it on…………..hey, they were ” Republicans “- what could possibly go wrong ?